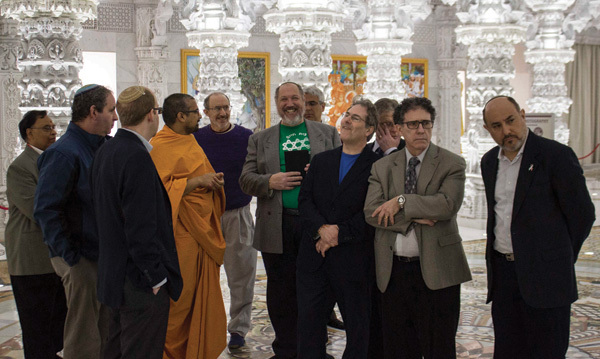 Members of the Board of Rabbis and Mercer County Jewish professional community meet with the priest of the BAPS temple in Robbinsville. Because Marc Citron, managing partner of Saul Ewing’s Princeton office, already had strong business relationships with the Hindu community, they knew he would play a key role. The three organizational partners in this effort are AJC, the Infinity Foundation, and the Forum for Religious Freedom. Citron’s relationship with the Hindu community began in 2003, when he began representing Bochasanwasi Akshar Purushottam Sanstha, or BAPS, a worldwide religious and civic organization within the Swaminarayan branch of Hinduism. Since then he has developed friendships with Hindus, and was even invited to India for the dedication of an akshardham, a BAPS temple. Citron sees a relationship between Jews and Hindus as mutually beneficial. “Because Jews have been here for four generations and Hindus have been here for now two generations, we’ve tried to extend to the Hindu community our experience in America,” Citron said. This includes providing entrée into areas where the Hindus are not well represented or have yet to develop contacts. One important reason for creating a bridge between the Hindu and Jewish communities is its relevance to Israel. Feldstein said that the Hindus have been very supportive of Israel and that just as many Hindus as Jews attended a program with the Israeli consul general from Philadelphia about Israeli economy innovations and investment opportunities. 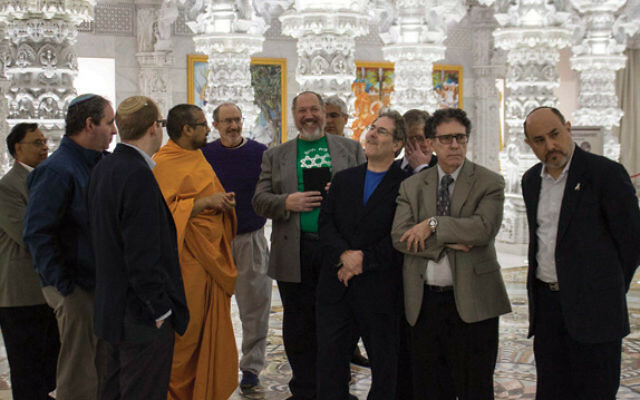 When legislative issues come to fore that might affect Israel, the coalition provides the Hindus with information on how to lobby senators and representatives. This support goes in both directions. “They have worked with us in opposing the boycott of Israel, and we’ve worked with them in opposing anti-Hindu legislation,” Citron said, citing a resolution that floated around Congress criticizing Hindus for not being open to other religious minorities. Feldstein recalls the first HJC meeting, a speed-dating-formatted event that served as an ice breaker for the sake of business networking, with a dozen Hindus down one side of a table and a dozen Jews on the other. They each had three minutes to share what they do business-wise as well as a few words about their personal backgrounds. Feldstein said, “It was a little funny at first, but then people caught on.” Better yet, he added, the event combined an Indian restaurant with Israeli wine. One panel with Hindu and Jewish speakers on the subject of entrepreneurship, a shared interest between the groups, drew 100 people. Another program, “Relaxation and Stress Management,” offered Hindu and Jewish approaches to meditation practice and was led by Hazzan Joanna Dulkin of the Jewish Center and Hindu representative Ruby Suresh. On Jan. 9 the American Jewish Committee is going to New York for a post-Hanukka celebration at the Indian consulate, and some Hindu friends will attend as well. The coalition has grown into friendships, more quickly than they had expected, Feldstein said, initially using each other for business services, and then moving into social, political, religious, and educational interactions. “One thing I love most about HJC, aside from the people I’ve met and finding what we have in common, is how enthusiastic people are,” Feldstein said.